BOYNE Valley residents are furious that they are flooded in yet again while authorities have no plan to solve the recurring problem. The valley is accessed by Gladstone-Monto Road, which is flooded whenever Lake Awoonga rises more than 1.5 metres over the dam's spillway. The road has flooded every summer for the past few years. The problem for residents in the Boyne Valley is that while lake's level drops fast from an extreme height, such as 5 metres, it begins to slow as it gets lower. When the lake gets down to 2 metres over the spillway, the rate of drop becomes painfully slow, so the road can be cut off for up to a week. On Thursday all phones were down in the valley, a result of flood damage yet again, but residents communicated on Facebook to make their voice heard. Resident Kaye Pownall said the Department of Transport and Main Roads should come up with a strategy to raise the section of the road that floods most easily. That section is about 250 metres long. "The (TMR) or the water board and TMR should realign the road to a higher area to miss this low section," she said. "It has now been under water for seven days in the 2010/2011 flood, one day in March 2012, and now seven days in January 2013 and again since February 26, whenever it (will) clear." "This has been a huge inconvenience to Boyne Valley residents, but to those in business it means loss of income and to the seventy-plus workers who commute to work it means lost work hours, income and time being stuck away from family if they didn't get home before the road goes under." Gladstone Regional Councillor Rick Hansen said the community the Boyne Valley community needed better access during floods. 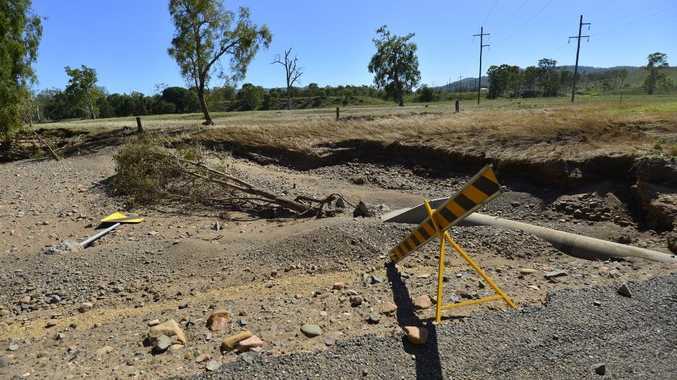 "I share Boyne Valley resident's valid concerns in raising the road to allow vital access for residents and businesses during Awoonga dam flood events," Cr Hansen said. Gladstone-Monto Rd comes under the responsibility of TMR, not the council. "Yes, it is a state road and we have had discussions (with TMR) in the past," Cr Hansen said. "I believe the council intends to highlight the many problems this issue has caused for the Valley community with Main Roads again and would hope to achieve some decent outcomes." The council and Boyne Valley residents could be waiting a long time. A TMR spokesperson gave no indication yesterday of when an upgrade was planned. "To ensure the safety of all road users, we regularly undertake important safety inspections across the state's road network, including Gladstone - Monto Road, the spokesperson said. "We recognise there are many flooded roads and communities across the region. "As water levels recede, we will assess the damage to the road network with RoadTek and local councils, including Gladstone-Monto Road." Gladstone-Monto Road remains closed to all traffic due to floodwaters at several locations including Marble Creek and Degalgil Creek. KAYE POWNALL: "The main roads or water board and main roads should realign the road to a higher area to miss this low section which has now been under water 7 days 2010/2011 flood, 1 day Mar 2012, and now 7 days in Jan 2013 and again Feb 26th - whenever it is clear." TRACEY BYRNE: "trouble is by the time anyone can get out here to see any damage all they are seeing is the "fixed" "bandaid" job ...... they don't get to see what we see before it gets repaired........only to get destroyed again during the next rain." ROD MARRIAGE: "Council only maintain what is a state controlled road. It is a state issue to upgrade and they must liaise with GAWB. Maybe we can get some of the $33 mil left over from the flood reconstruction from I think 2010/11." FRANK MCKEE: "The road levels were signed off by all stakeholders. Even after vigourous lobbying they still were happy to sign off on it. These entities now must collectively revisit the situation and correct their blunder. None of them can claim they were not warned."